For years I struggled with how to best record my observations and guided reading notes. I have looked at lots of different ideas online, and have tried several out in my own classroom. But, I always keep coming back to the simplicity of this form. I developed it several years ago when working with the kindergarten teachers in my building. Their lesson plans for guided reading are stored separately, by book, and they needed the best way to store their observations during their daily guided reading groups. This form is designed to be used by student, and then stored by group. For me, this means in a binder I keep on my table. Because there is a form for each student, rather than by group, it’s really easy to rearrange as your groups change throughout the year. It also helps give you a quick look at students’ trends and improvements during guided reading lessons to help you focus your on-the-spot lessons or reteaching. I also made this student profile form I track my students’ assessment data on reading benchmark and progress monitoring, and then also use it to track goals for the student. The goals are overarching goals, but I am able to choose a few goals for the year to really focus on with students. An example would be, “Able to identify text evidence to support an answer to a literal comprehension question”. Or, “Uses correct word endings while reading resulting in correct sentence syntax”. I set these goals based on my observations during running records at the beginning of the year. When I used this form in first grade, my goals, were much more focused on reading strategies used during reading, but now in second grade they’re focused on comprehension skills. I’m able to track the students’ progress with each of these goals on the observation form above, and change them during the year as needed. In an effort to have forms that meet the needs of more teachers, I’ve also created a few other notes forms. Some just have a slight change in language, but I’ve also created this checklist version that makes it quicker and easier to record during group sessions. 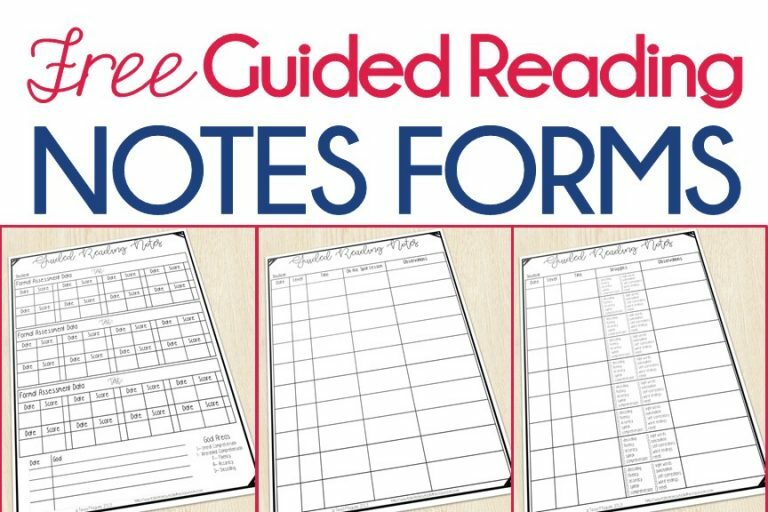 To get copies of these free Guided Reading Notes Forms, just click any of the images above or the cover below to head to my TpT store to download them. To see more about how I manage Guided Reading in my classroom, you can read my post with ideas for organization and planning- including my free guided reading lesson plan forms. I like your form for guided reading. I keep a binder that has a section for each group and in there I put: lesson plans, word work activities, and strategies appropriate for that level (I photocopied all of the Fountas and Pinnell Continuum quick reference sheets). In the back on my binder I keep a tab for each student. I keep sight word checklists, running record forms, and individual notes on students in there. For keeping track of on the fly observations I use a sheet of address labels where I write the student's name, date, and GR level, and then any notes I want to remember. When I have time, I transfer these labels into the student's note's section in their tab. That way I'm not always flipping through my binder trying to find the student's section, because often there is not time when you want to make a quick note. We are keeping our lesson plans for each book on index cards and in an index card box. That way, teachers can share lesson plans and they'll know which books are not available because the card is out. The teachers are storing these sheets by group so they can easily write observations and this way they don't have to rewrite entire plans daily! Thank you for this freebies. I was trying to think of an easy way to keep documentation for each guided group. Especially my RtI children.